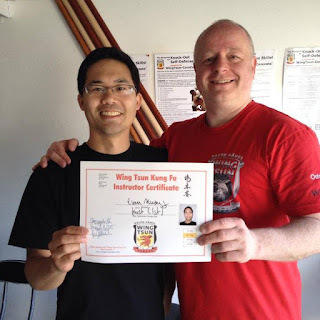 kyklosphaira wing tsun kung fu blog: First Technician Grade! It’s been more than 10 years since I started Wing Tsun (in Toronto with Si-Hing/Sifu Asad Mir). I’ve had the opportunity to learn from Sifu German Ferrer of Calgary Wing Tsun and Sifu Ralph Haenel of Wing Tsun Kung Fu Vancouver, and of course from all of the Si-Hings and Si-Dais. Although Wing Tsun started as a hobby and done in a part-time manner, it has remained a passion of mine. Since being back in Vancouver for nearly 2 years, I have been grateful to be training more consistently with Si-Fu Ralph Haenel. Earlier this year in April, I was awarded the 1TG aka First Technician Grade in Wing Tsun Kung Fu. What does it mean to be a technician in Wing Tsun Kung Fu? I have heard some say it is like the first Black Belt. Actually some also say that the landmark Student Level 9 in Wing Tsun is equivalent to a Black Belt. But I’m actually not clear about what the different standards of a Black Belt are in other martial arts systems, so I can’t say much about that. What I can tell you is that in the original Leung Ting Wing Tsun system, there are 12 Student Levels before the Instructor Levels, which include 4 Technician Levels, 4 Practitioner Levels, 4 Philosophical Levels. Some may also say that as a First Technician, one should be a good “fighter” by now. I don't feel like a good fighter, but then again I don't know how to define that. Supposedly as a First Technician level, one has become more proficient and now improves the “techniques.” Interestingly, I believe (as of today at least) that a true understanding of Wing Tsun Kung Fu means there are no techniques per se. It is, as Si-Fu would say, adaptation to chaos. Apparently that is why there are now HG (Higher Grade) levels instead in the EWTO. Why are there levels? When standardizing a system or program taught around the world, it is useful to sub-divide, compartmentalize, and categorize. But when learning something like Wing Tsun Kung Fu, one is really learning about how to move one’s body efficiently. It is more like a continuum. A journey. If this is the case, so then why test and why advance? But then, from my past experience as a Student Level 9-10 training with some that were supposedly 1TG (not in Vancouver! ), I didn’t feel that level of skill difference that ought to have been there. Which led me again to think that it didn’t matter what level I was in Wing Tsun. It mattered that I was learning, progressing, and improving, but now more importantly achieved a certain standard coming from the eyes of an experienced and skilled instructor. And in Vancouver, that would be from Si-Fu Ralph Haenel. In the end though, I think we all secretly yearn to advance levels in Wing Tsun. When investing time, money, effort, sweat, we as humans all want to progress, advance, and improve. We all wouldn’t mind receiving a pat on the back and being acknowledged. This yearning is not only limited to training in martial arts, but in other endeavours as well. People like status. People like certifications and credibility. But all of this requires… you guessed it… commitment! And kung fu (hard work)! And for someone who wants to commit even more to Wing Tsun and teach, I think having certification from someone like Si-Fu Ralph is important. Regardless of achieving the 1TG level though, after so many years of training in Wing Tsun (despite the part-time status), I feel as though a deeper understanding has only just begun. There are also programs and training methods including Chi Sao Functional Strength Training, Lat Sao, Blitz-Defense, Folding and Sliding programs, Weapons Chambers, etc. Then there are applications, which is an ongoing learning process. And don’t forget about the CoreConcepts. The whole advanced team must be now Masters of Wing Tsun! You laugh, but others who have “learned” the whole system actually might claim this. Merely learning and “pocketing” the whole system does not make one a master. This framework has helped me think and “cross-reference”, as Si-Fu would say. It has helped me analyze numerous ideas, movements, and applications. How each motion fits into the interweb of Wing Tsun. 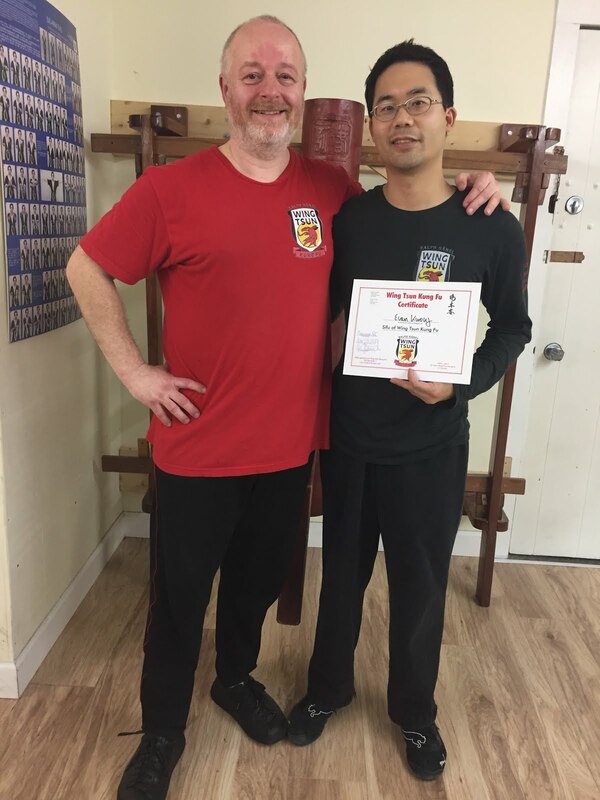 I don’t think it is absolutely only due to seeing the framework that has helped me start understanding Wing Tsun better, as much as it has been being more immersed into Si-Fu Ralph’s teaching methods and amazing skill level. It has taken some time for me to learn how to move. Actually, I am still trying to learn how to move, and generate power from the toes to the fingertips, and absorb/redirect from the fingertips to the toes. It is fairly amazing what the human body can do.